Best View in Brooklyn: Stop the Foolishness! I know it's not the hip thing to admit, but I was a Clinton supporter when the primaries rolled into New York State. I didn't get to vote because I'm registered as an Independent. I have yet to fix that. But I would have voted for Clinton if I could have. Since the primary, I've been more and more disappointed with the Clinton campaign tactics. I still like Hillary, and I will vote for her if she gets the nomination. Watching (most of) the debate two nights ago was disturbing all over again. Clinton (and the moderators - one a former B. Clinton staffer!) would not let some points go. I longed to hear her say, "You know, this doesn't have any direct bearing on the real issues for the people of the USA. Let's move on to something else." I longed to hear that when the whole "nasty-talking-minister" stuff came up again, and I longed to hear it when a Hannity-inspired question came up about some hippie-turned-professor in Obama's hometown came up. But no. Disappointment reigns. 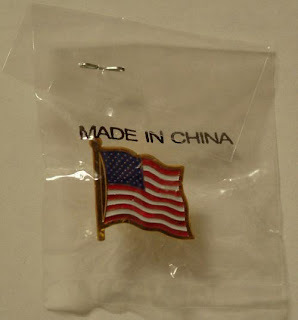 Another moment of foolishness appeared about wearing a flag pin. Uh, hello? Anyone can stick a pin in a label. It doesn't change what you believe. It doesn't change who you are. For a trend that started after 9-11, it's become something of a ridiculous measure of patriotism. As Obama pointed out, "That became a substitute for, I think, true patriotism which is speaking out on issues that are of importance to our national security." What good is wearing a pin if your actions don't support it? (Nixon wore one during his assertion that he had nothing to do with Watergate.) Clinton wasn't wearing a flag pin during this last debate. Was she feeling less patriotic that night? I guess I really am out of touch with the American public if THAT is the measure of a good president. Golly gee. I've never received an anti-Obama or anti-Clinton email, but I've seen a few snippets from each. How ugly. How full of lies and misstatements. Enough with the Hussein comments. Enough with the Clinton shot Vince Foster herself. I guess I am just as naive as Obama. I expect people to recognize the smell of yellow journalism and propaganda and piles of stinking lies. Silly me. Obama has said several times that he trusts the American public to sift through misinformation and read and listen to more than sound bites. Silly Obama. My high school history teacher had this much repeated quote from Henry Mencken painted on the classroom wall: "No one ever went broke underestimating the intelligence of the American people." I remember being at once impressed with how "radical" this teacher was and offended because I was one of the American people. Maybe we should tell Obama that no one ever got elected president overestimating the willingness to sift through manure of the American people either. Not a good time to be underestimating or overestimating.